much hustle-bustle….but then all I want is to be alone, with my thoughts. steps which you thought you could never ever take. 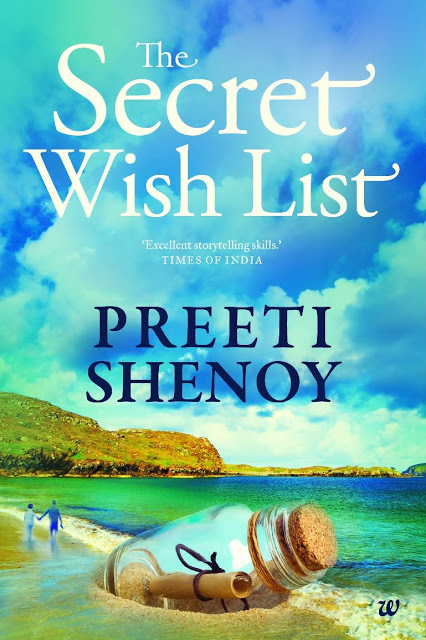 awaited book ‘The Secret Wishlist’ by Preeti Shenoy. Her books always revolve around the complexities of Friendships, Love, Relationships and Life. those million unexplainable feelings in her words with ease. shaken, and for last four days all I am doing is an Audit of my life, as if it were to end in few days. this one act was about to change her whole life. married women at some point of their life, do feel left out and taken for granted. Diksha deals with it is what makes the difference and makes this story unique. Wishlist’ in just 4hrs12 mins , I must say…it’s one of Preeti’s BESTEST! your inner-voice and don’t forget to pen down your ‘Wishlist’. Wish you all a Merry Christmas…! Equally applicable to men I feel. After all it is a universal wake up call – not only to women 🙂 . Most management books teach you to have a goal in life. I find those are more things such as I want to be the CEO or I want reach a certain level etc. Most people never make a personal wishist. The book and you rightly point out that life is short – do what you have to do. I must lay my hands on this book. Thanks for your wishes and may you all also have happy times. I truly feel that there should be an appraisal of our personal life and we should have SMART goals on the personal front.